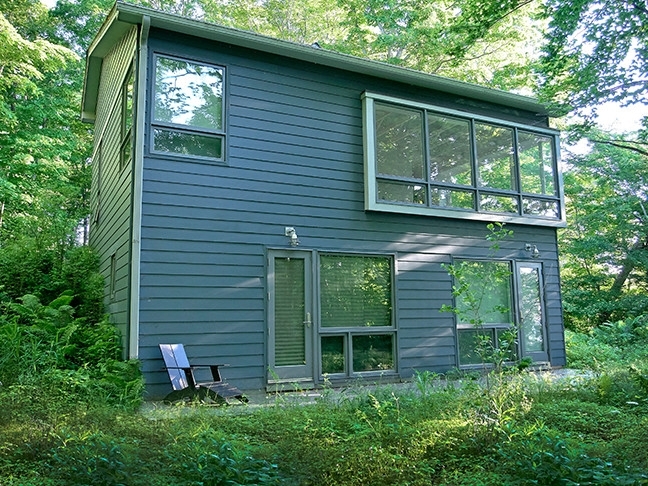 This contemporary cottage is situated on a wooded lot in eastern Wisconsin, with views of Lake Michigan. 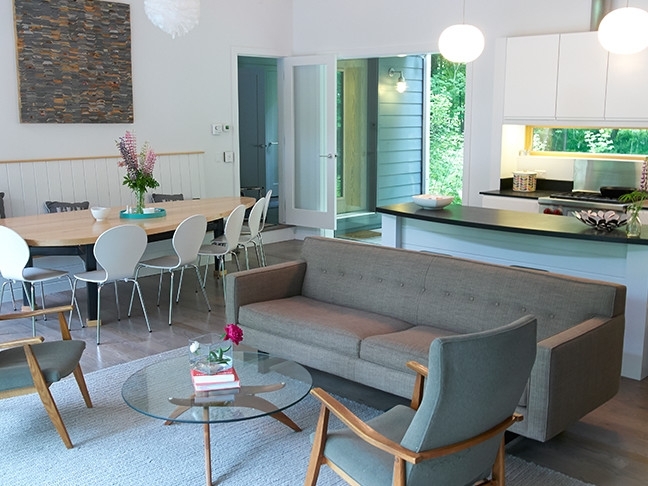 From conception, the design focused on the home’s setting. Intended for family retreats, care was taken to keep the spaces intimate, with emphasis on the outdoors. The split-level plan utilizes existing topography, and separates guest rooms from the living area and master suite. The front deck, nestled behind a retaining wall, is large enough for sunset dinners. On axis with the steps, a large picture window allows views through the house to the lake beyond. The mudroom/foyer serves as an air lock during the winter and a place to “de-bug” in warmer seasons. The main level’s multipurpose room houses the open kitchen, dining and living spaces. Having eastern and western exposure, the room is inviting at both breakfast and dinner. Massive glass doors focus views east to the lake. A fireplace with reclaimed wood provides an intimate space along north wall. A step up from the living area, the master bedroom peers into the tree canopy through large plate glass windows. A lower band of screened awning windows falls below the main sightline and provides ventilation even in light rainfall. The home is not air-conditioned. A pair of oversized corner windows above the tub opens the master bath into the woods. The design includes sustainable features such as geothermal heating, utility grade floors, and Richlite counters. 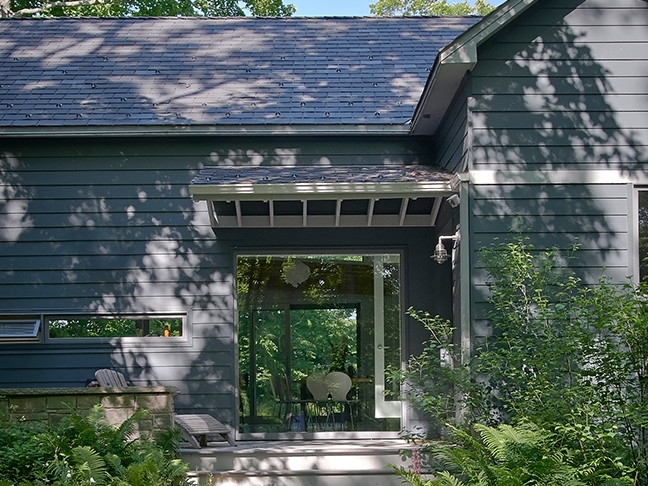 Recycled rubber roofing and cement siding were chosen for their long life. Throughout the design and construction process, the property’s history emerged through site exploration and insight from local community members. The construction crew resided within fifteen minutes of the site. All these elements strengthen the relationship between the land and the structure.